This recipe was one of my Nan's signature dishes, along with steak and kidney pie and a bloody good roast. Since she taught me how to make it when I went to Uni, it has become my ultimate comfort food; it is by no means healthy, but tastes delicious and is easy to throw together. Now, whenever we make this we think of my Nan and lots of happy memories. Cheesy chicken is part of her legacy! Shis will serve two people! You basically need one chicken breast and one packet of crisps per person. To start, melt a large knob of butter in a pan. 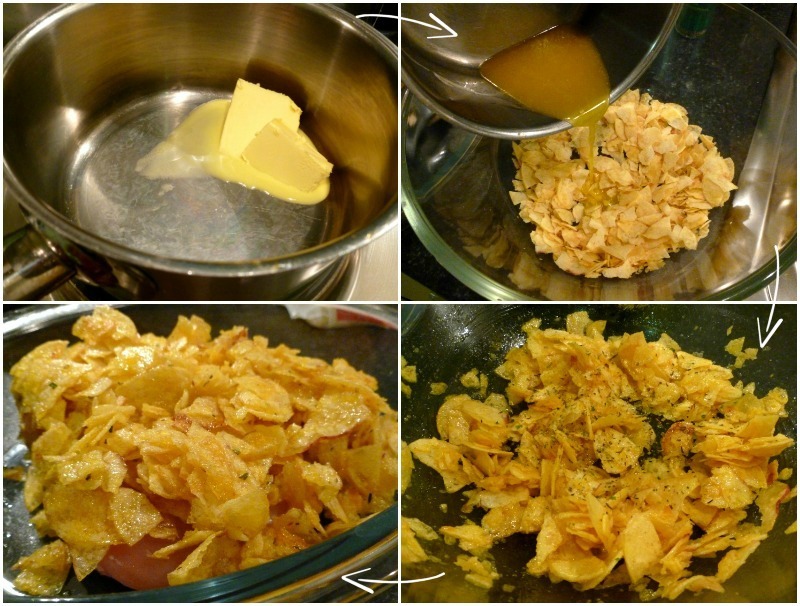 Crush the crisps into small pieces and pour into a bowl. Add the butter. Mix together until all the crisps are coated, and add some mixed herbs. Place the (uncooked) chicken in a oven-proof dish and cover with the crisp topping. Cover the dish loosely with foil, and put into the oven (approx 180C) for about 20 minutes. After 20 minutes, remove from the oven and top the crisp mixture with grated cheese. Add as much or as little as you want! Put back in the oven (without foil) for about 10-15 minutes. Remove from the oven, and check the chicken is cooked all the way through. Serve with roasted new potatoes and steamed veg. Variations: you could add anything to the crisp topping; finely chopped (cooked) bacon or chorizo are pretty tasty additions! Steam small new potatoes (skin on) for about 15 minutes until pretty much cooked. Remove, and put into a baking tray with some oil, balsamic vinegar and rock salt. Shake it all together and put in the oven for 15 minutes (I put these in when the chicken goes back in with cheese on) until crispy! Ahh! This looks so yummy. I love comfort food (hell to health, food brings a lot of comfort in times of need - i.e. most of the time). I'm definitely going to try this, something so simple. Plus, I am a sucker for anything cheesy. This looks amazing! Anything cheesy is a sure winner in my book haha. I never thought cooking with crisps would be a thing, but my best friend has some crazy recipies like this too and I love it when she cooks them for me. I will deffo try this out sometime, although I'm almost certain I'm lactose intolerant, just not willing to give up cheese haha!